Off the beaten track, you venture into the remote and wild area of the Icelandic Westfjords. Follow Jules Vernes journey to Snaefellsjökull and towards the centre of the earth. Cross the Breidarfjördur bay and marvel at steep cliffs with nesting puffins, picturesque fjords, steep waterfalls and sweet villages. Your Bus and travel Guide welcome you at the airport and take you to a city tour through Reykjavik to see the most important attractions of the city, such as the presidents’ residence in Bessastaðir and the Höfði-house, the scene of the meeting between Ronald Raegan and Mikhail Gorbachev. Walk through the old city and have a look at the parliament, the town hall and the cathedral Hallgrimskirkja. Today you will follow the Golden Circle, the famous route connecting some of Iceland’s main attractions. In the Thingvellir National Park, foundation place of the first parliament, you can walk between the continental plates as they drift apart. Visit the “Golden Waterfall” Gullfoss and marvel at the Geysir Strokkur shooting upwards at regular intervals. Here you have the possibility to try fresh bread baked on the hot surface of the earth with eggs and herring (optional). Next stop is Snaefellsnes on the west coast – at the tip of this peninsula towers the glacier Snaefellsjökull. Follow the tracks of Jules Vernes to the centre of the earth and dive into a lava cave at the foot of the glacier. Along the coast you will find many interesting lava rock formations and maybe recognize a popular film location around the mountain Kirjufell. The ferry Baldur takes you across the Breidarfjördur-Bay, past the little island Flatey with its rich bird life. With some luck you will even glance some whales on your way to the Westfjords. Along the coast, past the red-sand beach Látrabjarg, you reach Iceland’s westernmost point, the Látrabjarg-Cliffs – a popular nesting place for puffins! The winding paths through the Westfjords follows along peaceful fjords and reveals impressive views behind every curve. Travel along the traces of the Gisla-Saga and admire the powerful waterfall Dynjandi. We recommend trying fresh waffles in the picturesque village of Þingeyri. In the afternoon you reach Isafjördur, the largest town of the area. 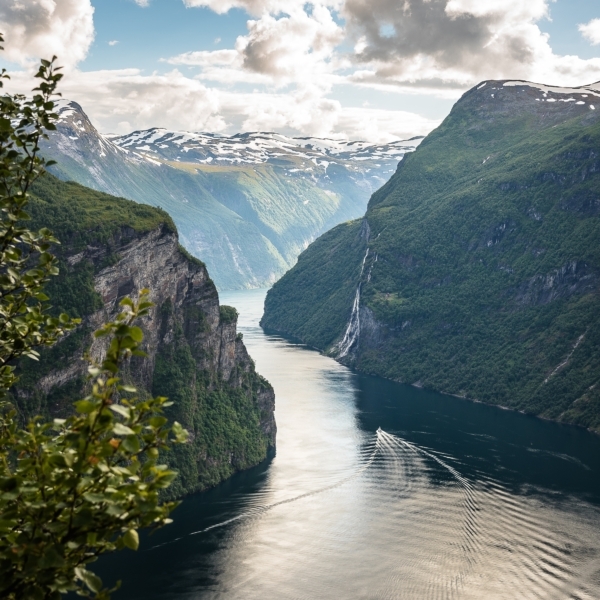 Past the spectacular ravine Valagil you continue your journey along narrow fjords and through small villages. On the east side of the westfjords, the sorcery museum in Hólmavík invites you to a curious stop. You leave the westfjords and travel inland to the region of Borgarfjördur, with powerful hot springs supplying the capital. Meltwater from the Langjökull- Glacier gushes through the Hraunfossar and Barnafoss waterfalls. On your way back to the airport of Keflavik you have the possibility to hike to one of Iceland’s highest waterfalls – Glymur – and to visit the volcanic craters on the Reykjanes peninsula. Or how about a relaxing bath in the Blue Lagoon (optional)? It is said that the mineral-blue water has a curative effect.